HEB Children's Shopping Cart, Spring Wagon, or Spring Wheelbarrow -- on sale for $10 each. All of that would normally cost $17.07 for all 7 items, but you'll get the whole kit and kaboodle for $10 after your yellow coupons. That works out to just $1.43 per item! 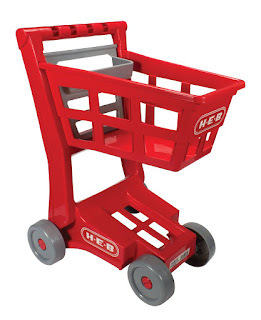 Want to learn how to save big $$$ on your HEB trips? Go here for my self-paced virtual coupon class!